Hair Transplant of the Front and Top. As innocuous as Hair loss SEEMS to be, it is often more devastating to the psyche of the sufferer than someone with a good head of hair might ever think. Stage 6 (and advancing) balding. While there is an element of vanity involved the real crux of the problem is the loss of one’s sense of self. Imagine looking in the mirror one day and not recognizing the person you’ve been used to seeing. This may sound like a plot from a thriller, but it happens everyday to men who have lost tremendous amounts of head hair. But as in a thriller, there are solutions, not the least of which is a hair transplant to the front and top of the scalp. The man in the photo to the right is an excellent example of a VERY common type of advancing hairloss. It started in the corners of his hairline and in a “pincer” like movement advanced around his forelock. Eventually even the forelock thinned out so that his entire hairline was lost and almost all of the top. By this point the crown was thinning out as well. 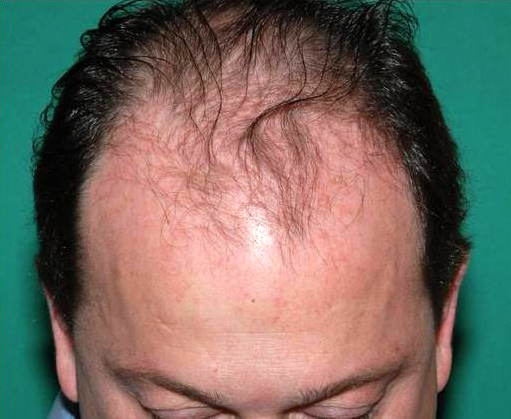 To address this Dr. Konior, a hair transplant expert in the Chicago area, evaluated this patient and came up with a plan. His goal was to restore this mans hairline and top in a SINGLE sitting. But Dr. Konior knew he’d have to be extra careful because this was a large amount of bald skin and, like all men, the patient only had a limited donor area. There was also the potential for further hair loss in the crown and that had to be taken into account as well. This is where the experience and skill of a doctor like Dr. Konior plays it’s greatest part. After initial examination the doctor identified the best place and shape for the new hairline. This had to be done right for two major reasons: The first was the hairline had to look natural. If it was off by even a little bit the casual observer would pick up on something being wrong in microseconds. The second was that Dr. Konior had to conserve the amount of hairs available because there was only a finite amount to utilize and there was a rather large area to fill. hair transplant of front and top. Notice that Dr Konior provided enough hair to frame the face AND cover the front and top of the scalp. Very few doctors can reach this level of coverage in a single sitting, yet Dr. Konior does this routinely. Below see a close up of the hairline combed upward. You would be hard pressed to find a more honest presentation. 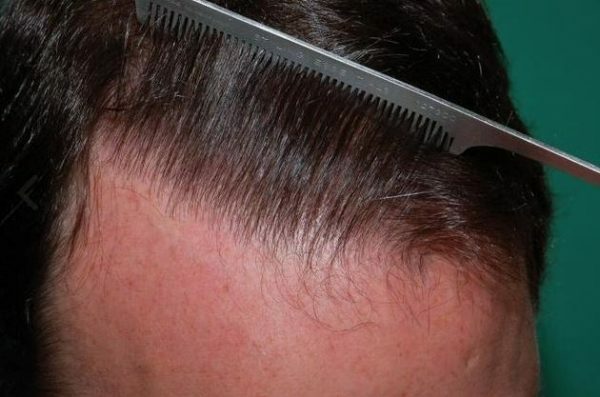 The hairline begins with single hair grafts placed in the very front in a random fashion to mimic nature, then double and triple graft FUs are included for bulk just behind. The rest of the transplant speaks for itself. So if you are in the Chicago area you owe it to yourself to check out Dr. Konior and his amazing team of experienced hair transplant experts.